I’ve used After Effects for a very long time and never ran into an issue where my RAM Preview was looking a little off, even at “Full” resolution. Strangely, while working on a 3D composite, I noticed that my RAM Previews had extreme banding and weird coloring, but that all disappeared once the RAM Preview stopped. Note that I’m working in Linear Workspace, with 32bpc via sRGB. Above is the image I’m getting when doing a RAM Preview (note the color banding in the tiles). To fix this weird color issues during RAM Previews, click the thunderbolt icon below the composition window, click on “Fast Previews Preferences”. 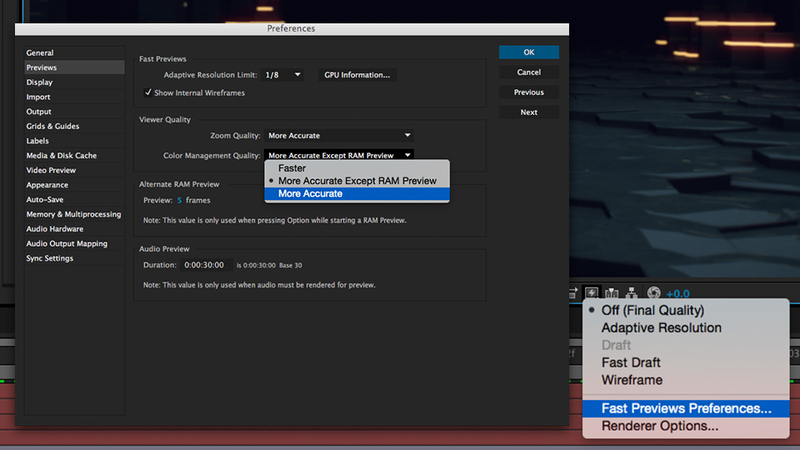 Under Video Quality>Color Management Quality, choose “More Accurate” to get better RAM Preview results. Just like that, all the banding and weird color issues disappeared. I’m not sure when Adobe introduced this feature, or if it’s always been there, but this is certainly the first time I ran into such an issue. Hopefully this helped you correct any weird previewing issues when working in different color spaces. How does this work on machines with less-than-ideal RAM? I’m at 32GB. Strangely, I see no noticeable difference. Even switching to “Accurate” doesn’t require me to redo my RAM Previews.